Thanks for visiting BikeWise 2010 - we hope you enjoyed your day. will be at the show with the HM Plant Honda Racing Truck and the riders bikes. The riders will be available throughout the day for you to meet and get autographs / photographs. BikeWise celebrates it's 16th year of running in 2010. 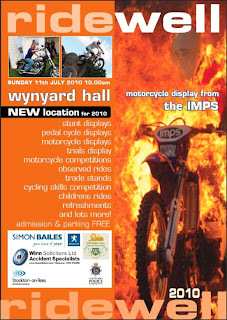 Put the date in your diary..
Cleveland Police's 10th 'Ridewell' event takes place on Sunday 11th July - Due to ongoing development at Preston Hall, the Ridewell team are proud to announce that this years event will be held at the prestigious Wynyard Hall. This year will see a stunning motorcycle display from the IMPS. For those not familiar with the team they consist of riders in ages from as low as 5years old! performing amazing stunts. The Imps have performed all over the UK and this summer will be performing at the Royal Edinburgh Military Tattoo, the Highland Tattoo at Inverness and at St Truiden Belgium together with a number of other events. Also this year we are pleased to announce that not one but two of the Countrys most popular and successful Race Teams will be returning to Ridewell for the second year, albeit one in different livery. Rob McElnea is bringing his new look Rob Mac Racing team here for the day so come along and meet the team and take a close look at some of the Race Bikes which will be competing in this years British Superbike Championship in the hands of Dan Linfoot and Ian Lowry. Also here on the day will be the new look Swan Racing Hondas, previously Hydrex Honda. The bikes you will see will be campaigned this year in the British Superbike Championship by Stuart Easton and James Ellison. Come along and have a look at the bikes and speak to some of the riders. Our local Bikeshow is back to it's traditional home of Witton Castle for it's 20th running on the 3rd, 4th & 5th September. 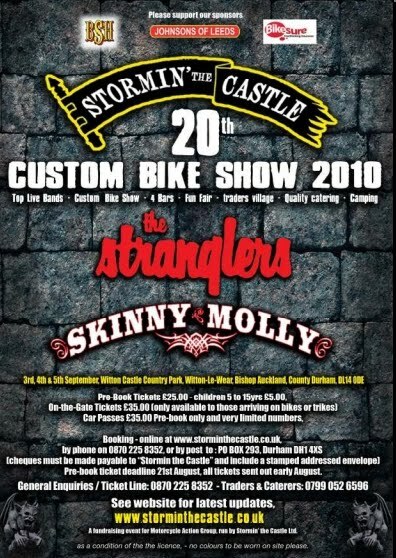 As well as top bands performing throughout the weekend there is, on the Saturday afternoon the Custom Bike Show. 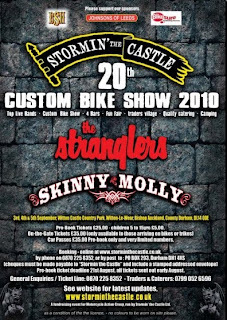 As the name implies this is a bike show for custom & classic bikes (and trikes). This includes any motorcycle which has been extensively modified, preferably by the owner. It must involve more than the fitting of one or two small custom parts. A machine which has been carefully rebuilt to standard specifications does not fall into the Custom category. Neither do bikes which can be bought from specialist ‘Branded’ companies on a ‘made to order’ basis. The Classic Section includes anything which was manufactured over 25 years ago. “Bikes of Notable Interest” An area, just outside the main show, will be provided where bikes which do not fit the show categories, and are ineligible to be judged in the show, can be displayed. To enter the bike in the show, bring it along to the Show Control between 9.00am and 4.00pm on the Saturday of the event. ALL BIKES MUST HAVE:- A CURRENT ROAD TAX DISC AND BE RIDDEN ONTO THE SITE.